Corbin J. Standley's Blog: Suicide Rates are Rising: Where Do We Go From Here? Suicide Rates are Rising: Where Do We Go From Here? Yesterday, the CDC released its annual mortality rates reports, including its report on suicide mortality for 2017. Overall, we've seen a 33% increase in suicide deaths in less than 20 years, and the increase from 2016 to 2017 was the sharpest increase in 50 years. Rates have increased across genders and ages, except for those over age 75. We also see that suicide rates in rural counties are 1.8 times those of urban counties. All of this is despite the fact that suicide rates are decreasing in most other places around the world. Suicide is not just a mental health issue. Most people with mental health conditions do not die by suicide, and recent data suggests that 54% of those who die by suicide did NOT have a known mental health condition. We need to go beyond the individual level and stop pathologizing suicide and suicidal behaviors. Multiple individual, social, and environmental factors (e.g. substance use, financial issues, relationship problems, etc.) have been shown to increase suicide risk, and that's where we need to increase our focus. We need to move beyond examining risk factors. 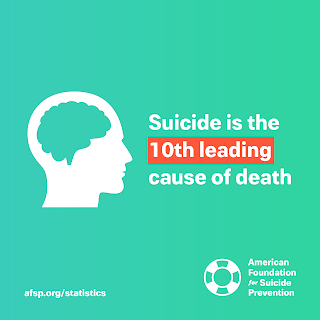 We know what the risk factors are, but comparatively little research has examined the role of protective factors in curbing rising suicide rates. We need to be better at crisis intervention. We need to be proactive about prevention, train communities to recognize the warning signs and intervene safely and effectively, and place the responsibility on us. Those in crisis should be encouraged to reach out, but it's on us to reach out to others, listen, and take care of each other. We need to better translate research into action. Recently, I received an email from a fellow suicide researcher via a listserv. In short, the email stated that researcher had some new findings related to a suicide intervention question that has long plagued the field of suicidology. The researcher was hesitant to post these findings in response to a specific question because the paper had not yet been published. The email troubled me, and it's one of the biggest issues I have with academia. Particularly in suicidology, research has very real potential to save lives, and thus should be shared widely. I don't fault the researcher, but rather the culture of academia and science in general. We need to use our research to inform practice to save lives, and we need to do so more quickly. Researchers need to become advocates. In a recent piece I wrote for the American Foundation for Suicide Prevention, I mentioned the need for researchers to use their knowledge and their voice to inform change. For too long, researchers have stayed siloed in their fields without translating that research into meaningful policy. Over the last year, I've been very engaged in political advocacy. I've gone into these meetings with a clear, constructive message and specific, concrete next steps, all informed by my own research and research in the field of suicide prevention. While not every meeting results in support, I've found the strategy to be effective both in Lansing and in D.C., and it has resulted in increased partnerships and policy change for the better (the recent passage of the H.R. 2345 and the introduction of H.B. 6252 are two examples). I mention all of this to say that not only can we use our research and expertise to inform policy change, but I feel that we have an obligation to do so. The research and science are so much more impactful if they can be translated into policy that results in positive change for communities, though it may take a lot of work and time to make that change a reality. nationally, yet we invest much more money into research for conditions with far lower mortality rates. The NIH spent $68 million on suicide research last year, but spent nearly five times that on sleep research alone. Only by actually investing in research and prevention can we make the strides needed to #StopSuicide. We need to promote and support resources. Not only do we need to promote invaluable resources like the National Suicide Prevention Lifeline, the Crisis Text Line, and the Trevor Project, but we need to do more to support these resources. We also need to better promote the missions and visions of organizations like the American Foundation for Suicide Prevention and American Association of Suicidology, and continue donating money to these lifesaving organizations. Along with a societal mindset shift, these are just a few of the things we need to do in order to make the change we want to see. Suicide prevention is a frustrating and exhausting field to be in at times, but I do know that we have the expertise and passion to make a difference. The next step is turning that into action. If you or someone you know is struggling with thoughts of suicide, please call the National Suicide Prevention Lifeline at 1–800–273–8255 or text TALK to 741–741. If it is an immediate crisis, please dial 911. For more information and resources, visit www.afsp.org. Copyright © Corbin J. Standley, 2018. Simple theme. Theme images by fpm. Powered by Blogger.